Two WACMOS-ET papers summarising the main findings of the project have just been published. You can visit our Publications page to get access to the papers. We take the opportunity here to thank all WACMOS-ET collaborators that helped us at different moments of the project, and to the reviewers that contributed to help us making the papers more effective in communicating the main project findings. Evaporation during the Australian Millennium Drought. Top panel: daily time series of surface net radiation (SRB 3.1) and latent heat flux from the three WACMOS-ET products for the Darling Basin during 2005–2007. ERA-Interim latent heat flux is also illustrated for comparison. Bottom panel: monthly time series of evaporation, precipitation (GPCC v6 with gauge correction factors from Fuchs et al., 2001), and discharge (GRDC). Reprinted from Miralles et al., 2016. 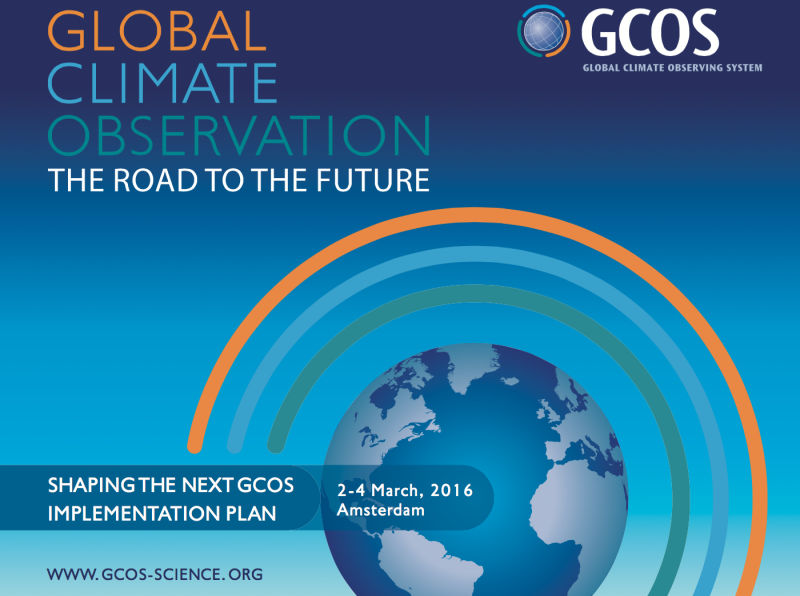 The Global Climate Observation: the road to the future conference is coming. It will take place in Amsterdam the 2-4 March and will discuss how to make further progress towards a fully implemented, sustainable, global observing system for climate, and how this is crucial for improving understanding of the workings of the climate system and assessing its impacts. We will have a poster at Session V, Future Observations and Communication of climate science, taking place on Friday at the coffe break. Pass by if you want to discuss specific aspects of the WACMOS-ET project with us, or chat about anything related to how to improve our current estimates of evaporation in the context of our current global observing system for climate. Wishing you all good things on this just started new year. Below, find an appropriate picture for the season showing hints of snow sublimation (the transition of water molecules directly from the solid to the gas phase). Sublimation is one of the evaporation components still challenging to reproduce in our present estimates, but of importance for those regions covered with snow for large parts of the year. Courtesy of Benjamin D. Oppenheimer, reproduced from the USGS website. 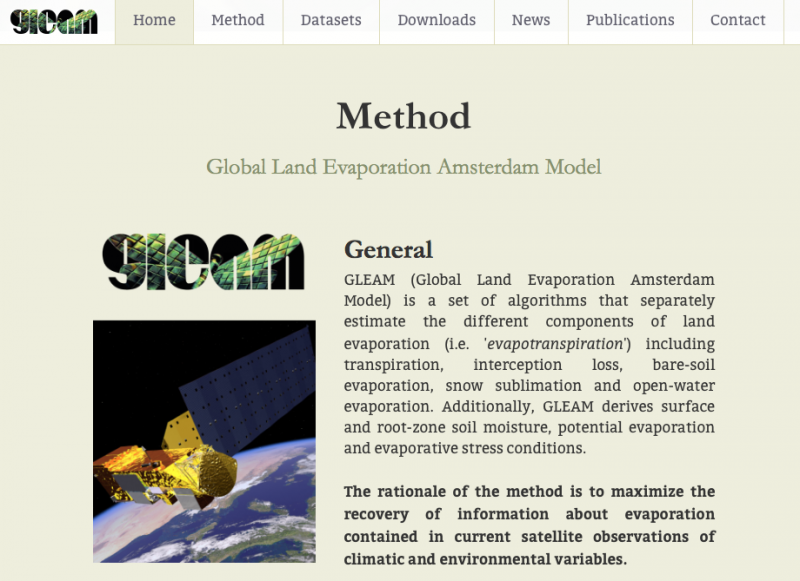 One of the evaporation models participating in WACMOS-ET (GLEAM) has opened a new website with information about the model and current research activities linked to the model. The website is also a portal to get access to GLEAM estimates of land evaporation and root-zone soil moisture. GLEAM developers are currently working on a new data release, expected early next year. We will be holding a session dedicated to review current progress at estimating ocean and continental and surface heat fluxes at the coming GEWEX/ESA Earth Observation for Water Cycle Science 2015 conference (20th-23rd October 2015, ESA-ESRIN, Italy). See below the preliminary programme. Results from WACMOS-ET will be presented at the talks of Diego Miralles and Ali Ershadi. We hope to see you there! 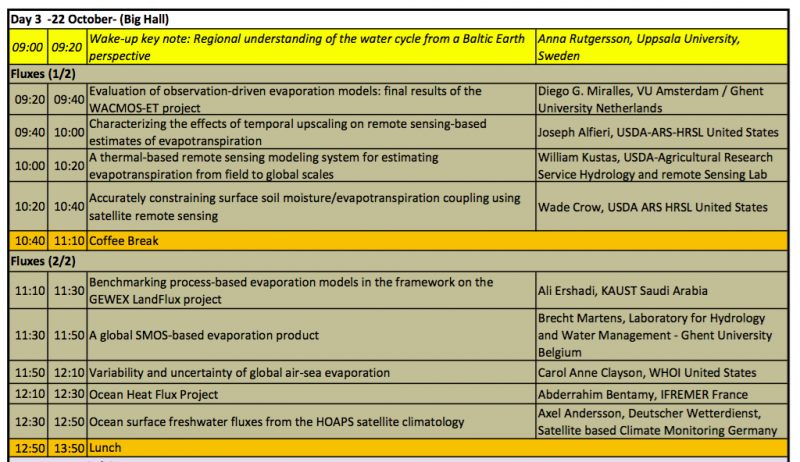 Oral: Wed, 15 Apr, 13:30–17:00 / Room R1, 14:00–14:15, EGU2015-6812, Evaluation of observation-driven evaporation algorithms: results of the WACMOS-ET project, Diego G. Miralles, Carlos Jimenez, Ali Ershadi, Matthew F. McCabe, Dominik Michel, Martin Hirschi, Sonia I. Seneviratne, Martin Jung, Eric F. Wood, Z. (Bob) Su, Joris Timmermans, Xuelong Chen, Joshua B. Fisher, Quiaozen Mu, and Diego Fernandez. Poster: Wed, 15 Apr, 17:30–19:00, R97, EGU2015-9254, Tower-scale performance of four observation-based evapotranspiration algorithms within the WACMOS-ET project, Dominik Michel, Diego Miralles, Carlos Jimenez, Ali Ershadi, Matthew F. McCabe, Martin Hirschi, Sonia I. Seneviratne, Martin Jung, Eric F. Wood, Z. (Bob) Su, Joris Timmermans, Xuelong Chen, Joshua B. Fisher, Quiaozen Mu, and Diego Fernandez. Oral: Wed, 15 Apr, 08:30–12:00, Room B11, 08:30–08:45, EGU2015-3596, Towards consistent Land Surface Temperature products from multiple satellite instruments: Validation Results from WACMOS-ET, Philipp Schneider, Joao Martins, Ana Pires, Isabel Trigo, Carlos Jimenez, Catherine Prigent, Fred Prata, Frank Göttsche, and Simon Hook. If you want to discuss the project with us, pass by one of the sessions and chat with us. We will be holding a session dedicated to review current progress at estimating ocean and continental surface heat fluxes at the coming GEWEX/ESA Earth Observation for Water Cycle Science 2015 conference (20th-23rd October 2015, ESA-ESRIN, Italy). As most of you know, the GEWEX Data and Assessments Panel (GDAP) is currently running the initiatives SeaFlux and LandFlux aiming at deriving global surface heat flux products that can be used together with the remaining GDAP satellite products to allow a comprehensive observation-based analysis of the water and energy cycle. These GEWEX efforts are supported by related activities from programs such as the ESA Water Cycle Observation Multi-mission Strategy project (WACMOS) and the NASA Energy and Water cycle Study (NEWS). We aim in this session to review all these current efforts and encourage the submission of papers related to these initiatives and projects and any other efforts working towards advancing in the estimation of ocean and continental surface fluxes from space. Abstracts can be submitted through the conference official website . Note that the deadline for abstract submission is the 30th April 2015. We hope to see you there! We have been very busy in the last few months completing the last phase of the project dedicated to generate a global record of 3 years of ET estimates using different algorithms and evaluating these products at the flux-tower and continental scales. 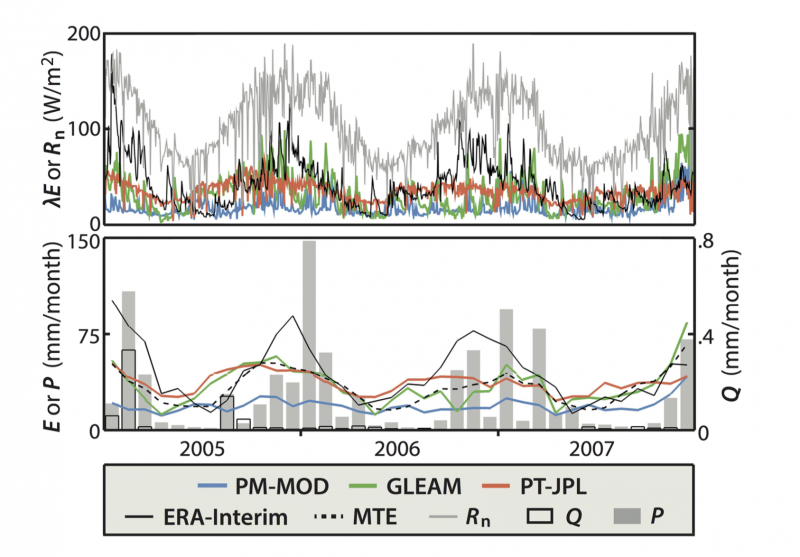 You can find below a summary figures that displays the 2005 annual global distribution of 3 of our products (a Priesley-Taylor approach (PT-Fisher), a Penman-Monteith algorithm (PM-Mu), and a simplified hydrological model run with satellite inputs (GLEAM)), and how their zonal means compared with the ET fluxes from the LandFlux-EVAL multi-product and the NWP reanalysis ERA-Interim. We will be holding the final project meeting at ESRIN, the headquarters for ESA's Earth Observation activities, the 28th April 2015. The project main findings and a description of the products and ET data records generated during the project will be available here a few weeks later, followed by an opening of the project archives to foster further activities on estimating ET from space. An overview presentation of WACMOS-ET will be given the 26th September at the CIGC in Geneva, as part of the session “Satellite data in global and regional modelling” of the 2014 EUMETSAT Annual Conference . The session will also have talks related to other hydrological variables, such as satellite soil moisture and snow water. The session starts at 8.30 in Room 4. Pass by if you want to hear about our current activities within the project. A recent discussion paper presenting a 10 year (2001–2010) dataset of land-surface energy balance for mainland China is under revision in Atmospheric Chemistry and Physics (Chen et al., 2014). The paper presents an algorithm based on the surface energy balance system (SEBS) to generate a dataset of land-surface energy and water fluxes on a monthly time scale from 2001 to 2010 at a 0.1° × 0.1° spatial resolution by using multi-satellite and meteorological forcing data. The developments include a remote-sensing-based method to estimate canopy height, which was used to calculate roughness length and flux dynamics. 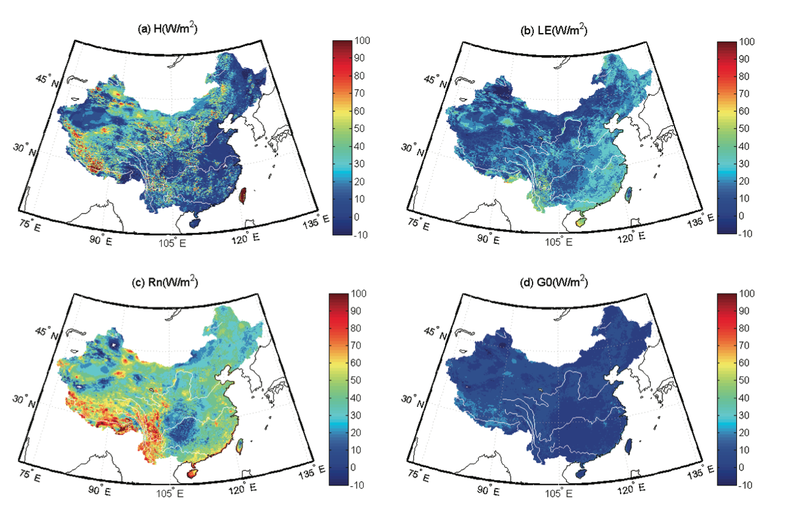 The land-surface flux dataset is validated against "ground-truth" observations from 11 flux tower stations in China, and it is reported that the estimated fluxes correlate well with the stations' measurements for different vegetation types and climatic conditions (average bias = 15.3 W m−2, RMSE = 26.4 W m−2). SEBS is one of the ET algorithms we are running within WACMOS-ET, and we will also be reporting an evaluation with a dataset of heat fluxes from flux tower stations. Maps of multiyear (2001–2010) means of retrieved fluxes: (a) sensible heat flux (H), (b) latent heat flux (LE), (c) net radiation (Rn), and (d) ground heat flux (G0). White lines show major rivers in China. Reprinted from Chen et al., 2014. CL3.3 session again, board number Z228, EGU2014-11035 Evaluation of various LandFlux evapotranspiration algorithms using the LandFlux-EVAL synthesis benchmark products and observational data by Dominik Michel et al. Session GI2.7, Tuesday, 29 Apr 2014, 10:44, PICO Spot 2, 11:04-12:00 at PICO Screen PICO2.8. 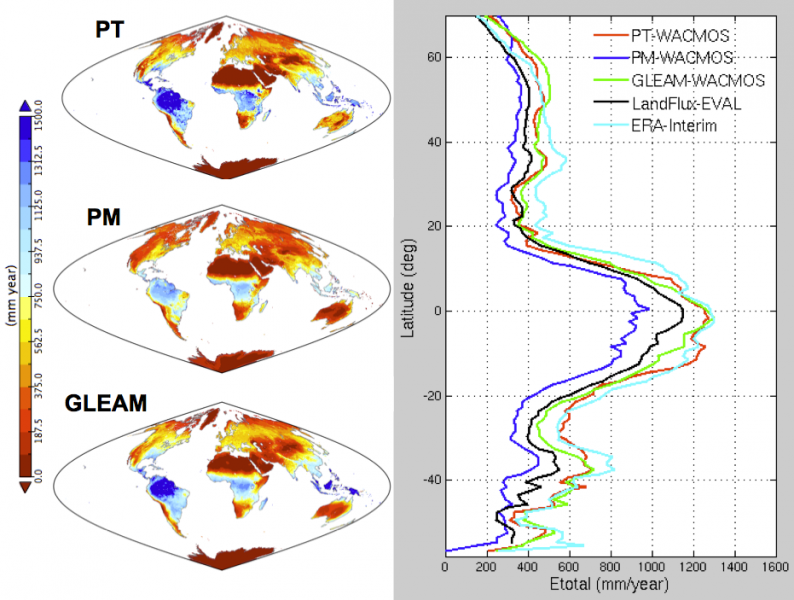 EGU2014-6238 Validation of Land Surface Temperature from multiple satellite instruments using worldwide in situ datasets and sensor inter-comparisons by Philipp Schneider et al. 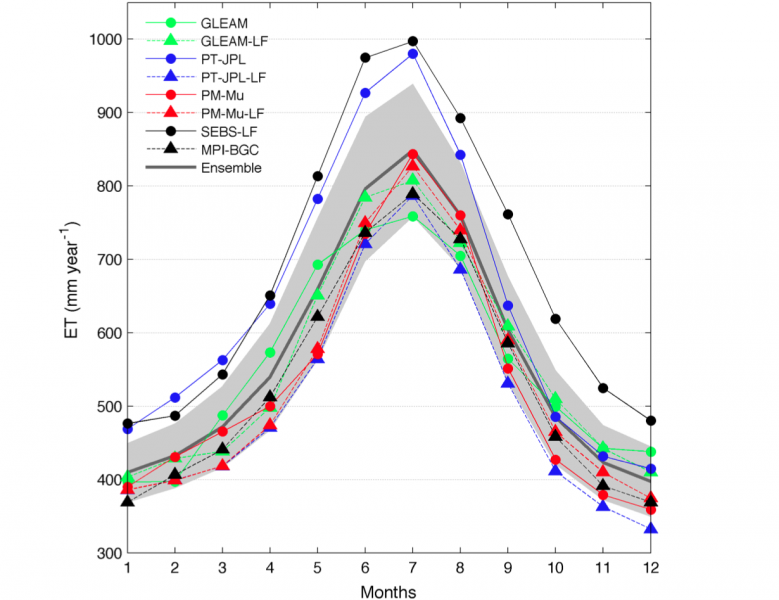 Session HS6.1, room R1 on Tuesday, 29 Apr 2014, 16:30 EGU2014-5034 ENSO and multi-decadal 'trends' in continental evaporation by Diego Miralles et al. A recent paper from some members of WACMOS-ET evaluating the performance of four commonly applied land surface evaporation models using a high-quality dataset of selected FLUXNET towers has been published (Ershadi et al., 2014) . Twenty FLUXNET towers were selected based upon satisfying stringent forcing data requirements and representing a wide range of biomes. The paper concluded that no single model was consistently best across all biomes, highlighting the need for further evaluation of each model’s structure and parameterizations to identify sensitivities and their appropriate application to different surface types and conditions. WACMOS-ET analysis will be contributing to this further evaluation of models. Location of the eddy covariance towers used to provide forcing and validation data in the study. Reprinted from Ershadi et al., 2014. Some of WACMOS-ET project members and collaborators have contributed to two book chapters discussing different aspects of estimating land surface heat fluxes from space (McCabe et al., 2013a) , (McCabe et al., 2013b) . The chapters include an assessment and inter-comparison of existing global products summarising some recent efforts from the GEWEX LandFlux-EVAL exercise, and a discussion on current status, opportunities, and future directions. Annual cycles of global average terrestrial evaporation in 2003 for a number of selected products. The grey line and shadow display the ensemble mean and the standard deviation of the individual product monthly means around the ensemble mean. Reprinted from McCabe, 2013. 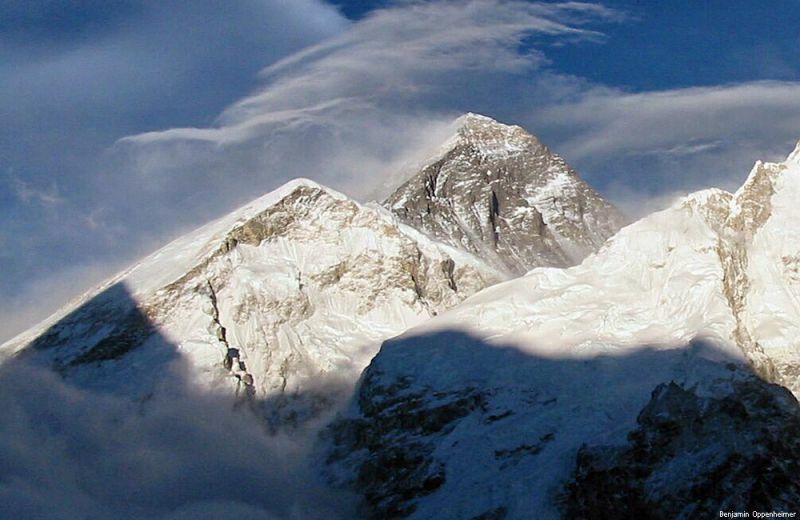 A story from ESA covering a recent study funded by the ESA WACMOS-ET project published in Nature Climate Change (Miralles et al., 2013) is presented at the Space for Climate News . Using data from Earth-observing satellites, Diego Miralles from the University of Bristol, together with a group of international researchers, found that the global average evapotranspiration declines are the result of droughts in Australia and southern Africa, which are caused by El Niño conditions. During El Niño periods, reduced precipitation in these regions leads to lower terrestrial moisture content, so there is less water in the soil available to evaporate. These regional reductions are so intense that they severely affect the global average volume of evapotranspiration. Global average evapotranspiration declines are therefore not caused by a more permanent reorganisation of the water cycle, but by natural climate variability. 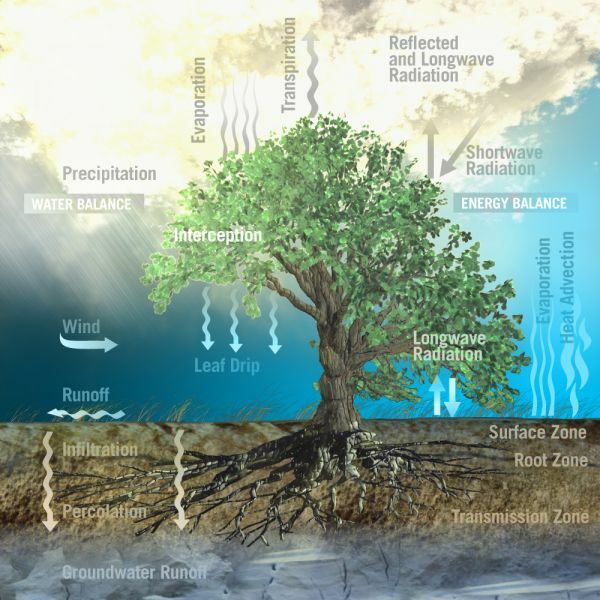 Illustration of the different terrestrial and atmospheric components of the water cycle. The links between the different components were studied in Miralles et al., 2013 to attribute the recent declines in global average evapotranspiration. Reprinted from the ESA website. A recent discussion paper reviewing the accuracy of seasonal evapotranspiration is under revision in Hydrology and Earth System Sciences (Karimi et Bastiaanssen, 2014). Only reported absolute mean errors for at least one season are included in the study. 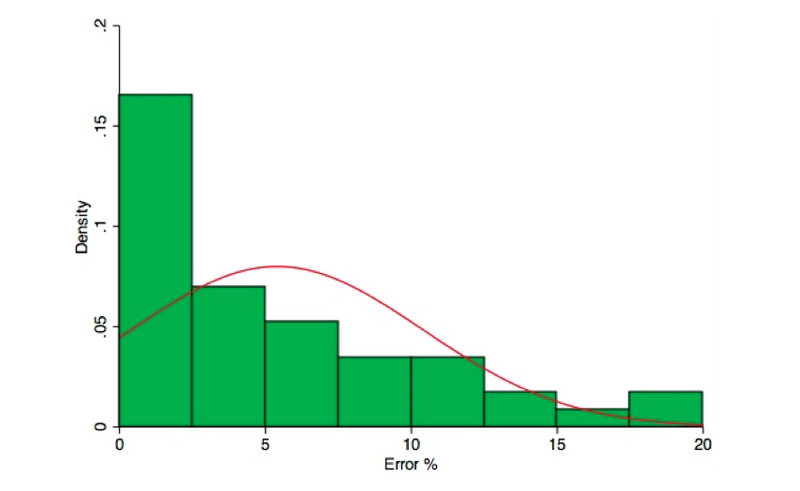 These errors are distribute as shown in the figure below, with a mean absolute error of 5.4 %. The authors found that many of the publications reported an error of less than 5 %, which they consider as a remarkable good and unexpected result. But they also pointed out that many authors of the papers were both the developer and the tester of the algorithms, so parameter tuning was in principle possible. Satellite rainfall estimates were also analysed, and the authors found a mean absolute error more than 3 times larger than for evapotranspiration. WACMOS-ET will be comparing evapotranspiration estimates from different models for a three year period over more than 100 Eddy Covariance measurement sites from FLUXNET, and we are looking forward to see our seasonal error distributions compared with some of the previoulsy published results over comparable domains. Probability density function of the reported absolute deviations between ET estimates from remote sensing, and field measurement of ET. A season or longer period was considered. Reprinted from Karimi et Bastiaanssen, 2014. A recent study funded by the ESA WACMOS-ET project has just been published in Nature Climate Change (Miralles et al., 2013). 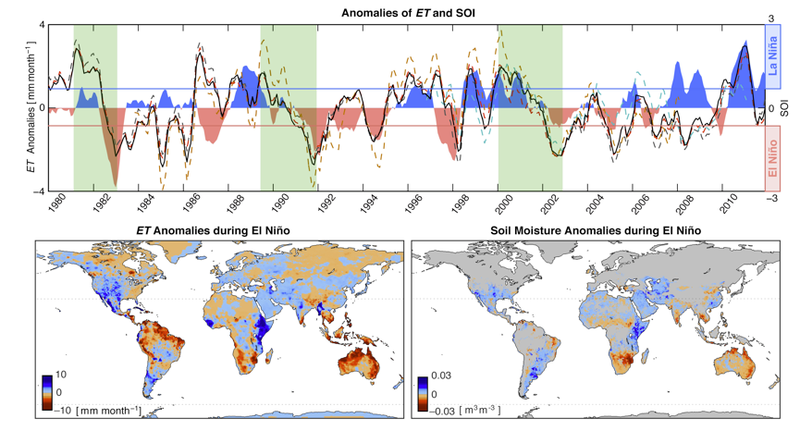 The work uses satellite data of terrestrial evaporation (ET), together with independent observations of soil moisture and NDVI, to uncover a strong link between ET and the dynamics of the El Niño-La Niña cycle. Miralles et al. (2013) suggest that previously reported declines in global average ET are not the consequence of a recent reorganization of the water cycle, but a product of internal climate variability. During El Niño, limitations in the supply of moisture in central Australia, southern Africa and eastern South America cause vegetation water-stress and constrain evaporation. These regional ET declines are so pronounced that govern the total volumes of water vapour from continental land surfaces into the atmosphere. On the other hand, in northern latitudes (where the effects of ENSO are weaker) continental evaporation has raised since the '80s at rates that are consistent with expectations calculated based on air temperature trends. Modified from Miralles et al., 2013. The ERA-Interim/Land is a global land-surface dataset covering the period 1979–2010 and describing the evolution of the soil (moisture and temperature) and snowpack. It is the result of a single 32 yr simulation with the latest ECMWF land surface model driven by meteorological forcing from the ERA-Interim atmospheric re-analysis and some precipitation adjustments. In a recent publication (Balsamo et al., 2013) the quality of ERA-Interim/Land has been assessed by comparing with ground-based and remote sensing observations, including a comparison of turbulent latent and sensible fluxes against a number of sites measurements. WACMOS-ET is using ERA-Interim meteorological fields as ancillary data for some of the products of its Reference Input Data Set, and to provide global estimates of some of the inputs required to test different global evapotranspiration models. The ERA-Interim/Land latent heat flux fields will be also looked at during our project and compared with our evapotranspiration estimates. Root mean square error (Wm2) for (a) latent heat fluxes and (b) sensible heat fluxes ERA-Interim (red) observed at 34 sites for ERA-Interim/Land (blue) and ERA-Interim (red). Reprinted from Balsamo et al., 2013. Matthew McCabe, one of the WACMOS-ET members, is given a presentation titled "The GEWEX LandFlux Initiative: development and analysis of a global land surface heat flux product" at the coming AGU Fall Meeting (December 10, session H24E, Remote Sensing of the Terrestrial Water Cycle III). The presentation will describe the recently released Version 0 of the GEWEX Data and Assessments Panel (GDAP) global terrestrial land surface heat flux product. Numerous challenges have presented themselves during product development, including issues of consistency in forcing data, difficulties in discriminating forcing from model induced error, undertaking independent/unbiased evaluation and the inherent compromises in algorithm choice and intercomparison. There are inevitably issues that remain unresolved, and the WACMOS-ET project, together with some other LandFlux collaborators, is contributing to explore some of the issues still requiring further investigation. One component of the mission of the GEWEX Data and Assessments Panel (GDAP) is to guide GEWEX projects towards providing an integrated product of the global water and energy fluxes in the atmosphere and at the surface. Two projects under GDAP are SeaFlux and LandFlux, which are focused on providing high-resolution ocean-atmosphere and land-atmosphere turbulent flux datasets, respectively. These two projects are meeting as a group together for the first time in a combined SeaFlux/LandFlux workshop, held in conjunction with the EUMETSAT/AMS Satellite Conference in Vienna, Austria. This combined workshop is bringing together experts in satellite remote sensing from both the land surface and ocean surface communities to discuss issues associated with understanding the global water energy and water cycles, to exchange about the leading- order difficulties and new advances in surface flux products, and to strategize about potential improvements to the GEWEX products. WACMOS-ET is an ESA contribution to the LandFlux efforts and the project will be presented and discussed during the meeting. 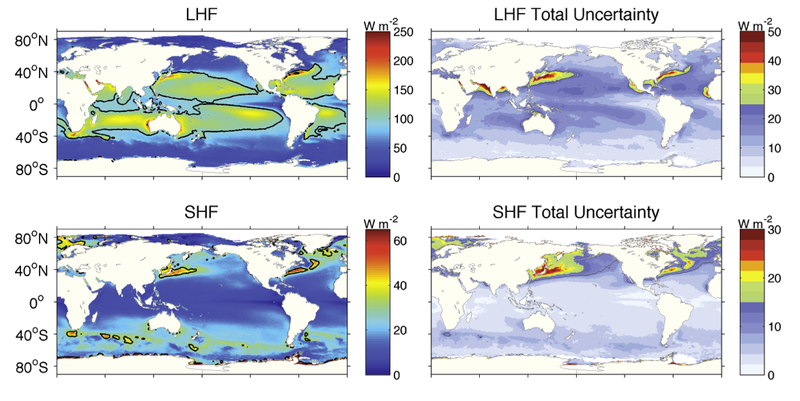 Mean fields from the 10 years of SeaFlux data for the LHF and SHF values and the associated total uncertainties. Contour lines on the LHF and SHF plots are at 100 and 35 W m-2, respectively. Reprinted from Clayson, et al., Seaflux Version 1: a new satellite-based ocean-atmosphere turbulent flux dataset. Int. J. Climatol., in revision. LandFlux-EVAL is an activity by some of the WACMOS-ET project members, led by ETH-Zurich, to evaluate and inter-compare existing land evapotranspiration products in the framework of the LandFlux initiative of the GEWEX Data and Assessment Panel (GDAP). 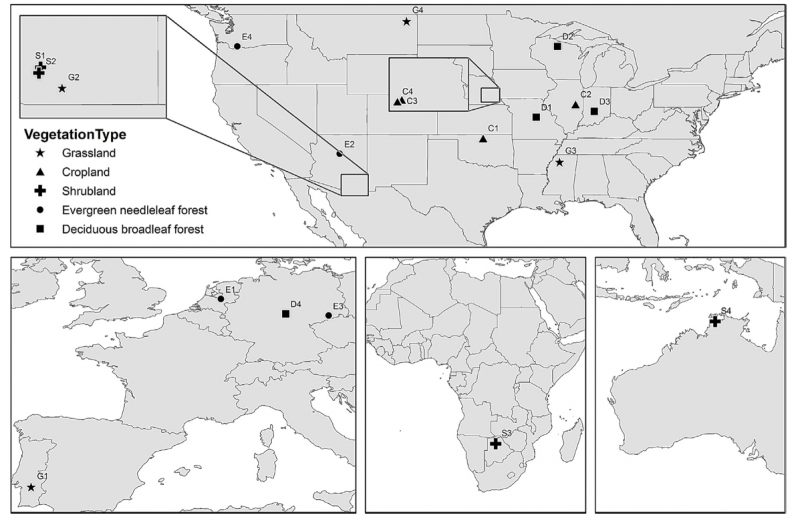 As a synthesis of these first evaluation activities, a multi-year global merged product based on the analyses of existing land evapotranspiration datasets (monthly time scale, time periods 1989-1995 and 1989-2005) has just been released. The calculation and analyses of the products are described in Mueller et al., 2013, and the synthesis products are available after registration. More information and acces to the data can be found at the LandFlux-EVAL website. Variations of globally averaged land evapotranspiration of the merged synthesis products derived by LandFlux-Eval. The short product only covers 1989-1995, but includes a larger number of products in the average. Displayed the median of the short and long products, together with the interquartile range and the standard deviation (over the mean) for the long product. Reprinted from Mueller et al., Benchmark products for land evapotranspiration: LandFlux-EVAL multi-dataset synthesis, Hydrol. Earth Syst. Sci., 17, 3707-3720, 2013.